An Edmonton man hailed as a local hero for saving people from a burning building last January has re-opened his donair shop after undergoing brain surgery. But with the bills piling up and his health precarious, Riza Kasikcioglu has made the heartbreaking decision to sell. 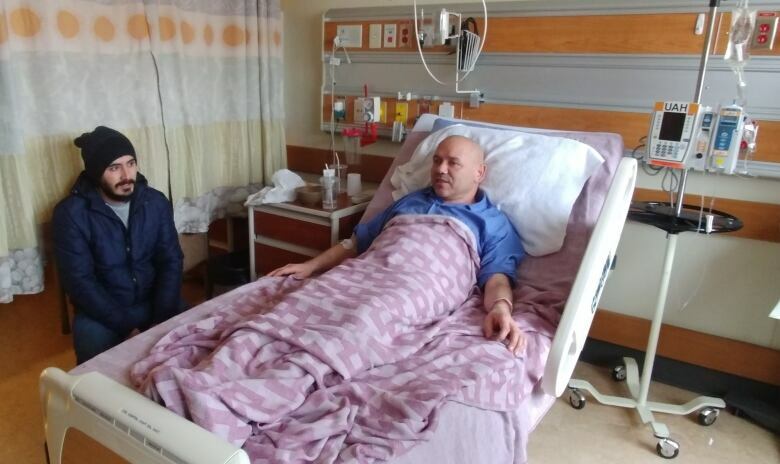 As he stands behind the counter of his downtown Edmonton donair shop welcoming back customers, there's little to suggest Riza Kasikcioglu is struggling with crippling pain. 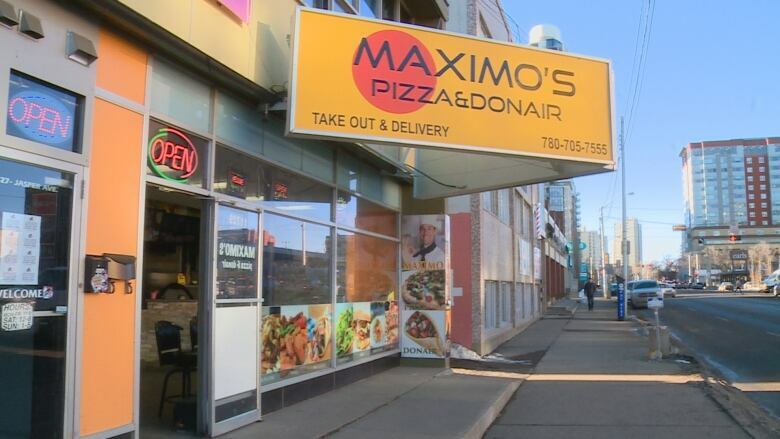 The owner of Maximo's Pizza and Donair on Jasper Avenue shot to local fame last January after he risked his life by sprinting into a burning apartment building to warn residents of a fire. But in the end, it was the Turkish immigrant himself who needed saving. Shortly after the fire, the 48-year-old was diagnosed with a brain tumour. It turned out to be benign, but it still needed to be surgically removed. That forced Kasikcioglu to close up shop while he focused on his recovery. Just before Christmas, he was discharged from the University of Alberta's neurosurgery unit to recover at home. His shop was supposed stay closed until at least April, but financial troubles have forced the family to re-open months earlier than planned. "It's taking time to get better. Now I have terrible pain but I don't show it, I'm just bearing it," Kasikcioglu said in an interview with CBC News on Saturday. Watching her friend work through the pain has been tough for Sim Senol, who's been helping the family for months. "When he's behind the counter waiting for customers, we tell him he needs to make sure that he sits down. He can't be standing around for long periods of time," Senol said. "He has this really fiery 'I have to run and do it' attitude, so we have to keep telling him slow down and rest." It's not a state of mind that's familiar to Kasikcioglu, especially with his family's livelihood at stake. He and his wife have two young sons, aged 9 and 11. "It's been tough for him and for his family, of course," Senol said. "All of a sudden they have no income. His wife was helping him at the store as well, so there's been no income whatsoever coming to the family. So financially it was tough." Maximo's had only been open for a little over a year when Kasikcioglu fell ill, but even then, the business was already struggling. The closure of a nightclub upstairs removed one of his biggest sources of late-night customers. Suppliers and banks have been calling non-stop over the past few months and Kasikcioglu's supporters decided opening the store early was necessary to keep the family financially afloat, said Senol. "When you're closed without any announcement for two months, you lose a lot of customers'" said Senol. "What we're trying to do is alleviate the financial burden in any way we can. So we've got to get the donair shop going so the family can have a little income." As of Saturday, Kasikcioglu was back at work inside his newly-renovated shop but is still struggling with his health. "The scars inside the skull are giving me a hard time. Sometimes I can't even walk," he said, with a sigh. "If I get tired during work, I sit down and my other friends handle the customers. So still, I'm having a hard time." Kasikcioglu said he often thinks about the day of the fire, an experience that changed his life. When he spotted the flames shooting from the seventh floor of the apartment building on Jasper Avenue and 118th Street last year, he didn't hesitate. He ran into the burning highrise, knocking on as many doors as he could to help people escape before the fire department had even arrived. Despite his efforts, one person died and another was injured. Before that day, he had been completely healthy, Kasikcioglu said. "After the fire my whole life changed. I have lots of pain in my body, spine and legs. I need another few surgeries actually," he revealed. "On the other side, I need to run the business so I'm limping and working right now." But it's proving to be a difficult balancing act. So, with the bills piling up and his health precarious he's decided to close the donair shop permanently. He described it as one of the most difficult decisions he's ever made. "I'm in hell right now because I have to sell this store. This is the solution for me," he said. "I want to keep it. I have lots of dreams. But it's very hard. When I opened this place, I was dreaming lots of good things, like opening one, two, three chains like McDonald's. But all those dreams are gone already." Kasikcioglu said he is desperate to keep the restaurant, but can only do so if sales improve. Saving the business would be a tribute to those who have given so much to help him during his convalescence, he said. "I have lots of heroes around me," Kasikcioglu said. "All of my friends in the Turkish community and all my Canadian friends and from all over the world, I have lots of support. They are my heroes. Thanks everybody." At the back of the shop is a long hallway, where Kasikcioglu said he plans to honour local heroes by putting up their pictures. He's already started with those who are helping him get back on his feet. "Whoever helped here as volunteer will go on first," he said. Another way Maximo's is trying to give back to the community is with a new initiative to serve those who can least afford it. Customers can now buy $5 tokens which will provide a homeless person with a meal. Despite his current difficulties, Kasikcioglu said he will never regret helping those in need, including those he helped escape the fire. Given the chance, he would do it again in a heartbeat. "If 1,000 times the fire happened I'm going to help them again 1,000 times yes. Even if I die. This is me."